For other uses, see Zanzibar (disambiguation). Not to be confused with Zinjibar. Zanzibar (/ˈzænzɪbɑːr/; Swahili: Zanzibar; Arabic: زنجبار‎, translit. Zanjibār) is a semi-autonomous region of Tanzania. It is composed of the Zanzibar Archipelago in the Indian Ocean, 25–50 kilometres (16–31 mi) off the coast of the mainland, and consists of many small islands and two large ones: Unguja (the main island, referred to informally as Zanzibar) and Pemba Island. The capital is Zanzibar City, located on the island of Unguja. Its historic centre is Stone Town, which is a World Heritage Site. Location of Zanzibar within Tanzania. The major islands of Unguja and Pemba in the Indian Ocean. Zanzibar's main industries are spices, raffia, and tourism. In particular, the islands produce cloves, nutmeg, cinnamon, and black pepper. For this reason, the Zanzibar Archipelago, together with Tanzania's Mafia Island, are sometimes referred to locally as the "Spice Islands" (a term borrowed from the Maluku Islands of Indonesia). 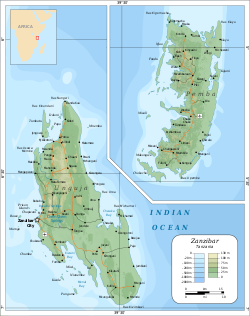 The word Zanzibar came from Arabic zanjibār (زنجبار [zandʒibaːr]), which is in turn from Persian zangbâr (زنگبار [zæŋbɒːɾ]), a compound of Zang (زنگ [zæŋ], "black") + bâr (بار [bɒːɾ], "coast"), cf. the Sea of Zanj. The name is one of several toponyms sharing similar etymologies, ultimately meaning "land of the blacks" or similar meanings, in reference to the dark skin of the inhabitants. The presence of microliths suggests that Zanzibar has been home to humans for at least 20,000 years, which was the beginning of the Later Stone Age. A Greco-Roman text between the 1st and 3rd centuries, the Periplus of the Erythraean Sea, mentioned the island of Menuthias (Ancient Greek: Μενουθιάς), which is probably Unguja. Zanzibar, like the nearby coast, was settled by Bantu-speakers at the outset of the first millennium. Archaeological finds at Fukuchani, on the north-west coast of Zanzibar, indicate a settled agricultural and fishing community from the 6th century CE at the latest. The considerable amount of daub found indicates timber buildings, and shell beads, bead grinders, and iron slag have been found at the site. There is evidence for limited engagement in long-distance trade: a small amount of imported pottery has been found, less than 1% of total pottery finds, mostly from the Gulf and dated to the 5th to 8th century. The similarity to contemporary sites such as Mkokotoni and Dar es Salaam indicate a unified group of communities that developed into the first center of coastal maritime culture. The coastal towns appear to have been engaged in Indian Ocean and inland African trade at this early period. Trade rapidly increased in importance and quantity beginning in the mid-8th century and by the close of the 10th century Zanzibar was one of the central Swahili trading towns. Excavations at nearby Pemba Island, but especially at Shanga in the Lamu Archipelago, provide the clearest picture of architectural development. Houses were originally built with timber (c. 1050) and later in mud with coral walls (c. 1150). The houses were continually rebuilt with more permanent materials. By the 13th century, houses were built with stone, and bonded with mud, and the 14th century saw the use of lime to bond stone. Only the wealthier patricians would have had stone and lime built houses, the strength of the materials allowing for flat roofs, while the majority of the population lived in single-story thatched houses similar to those from the 11th and 12th centuries. According to John Middleton and Mark Horton, the architectural style of these stone houses have no Arab or Persian elements, and should be viewed as an entirely indigenous development of local vernacular architecture. 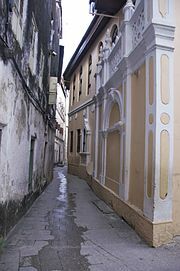 While much of Zanzibar Town's architecture was rebuilt during Omani rule, nearby sites elucidate the general development of Swahili, and Zanzibari, architecture before the 15th century. Persian, Indian, and Arab traders used Zanzibar as a base for voyages between the Middle East, India, and Africa. Unguja, the larger island, offered a protected and defensible harbor, so although the archipelago offered few products of value, traders settled at Zanzibar City ("Stone Town") a convenient point from which to trade with the other Swahili coast towns. The impact of these traders and immigrants on the Swahili culture is uncertain. During the Middle Ages, Zanzibar and other settlements on the Swahili Coast were advanced. The littoral contained a number of autonomous trade cities. These towns grew in wealth as the Swahili people served as intermediaries and facilitators to local, inland mainland African, Arab, Persian, Indonesian, Malaysian, Indian, and Chinese merchants and traders. This interaction contributed in part to the evolution of the Swahili culture, which developed its own written language. Although a Bantu language, the Swahili language as a consequence today includes some elements that were borrowed from other civilizations, particularly loanwords from Arabic. With the wealth that they had acquired through trade, some of the Arab traders also became rulers of the coastal cities. In 1698, Zanzibar came under the influence of the Sultanate of Oman. There was a brief revolt against Omani rule in 1784. Local elites invited Omani merchant princes to settle on Zanzibar in the first half of the nineteenth century, preferring them to the Portuguese. Many locals today continue to emphasize that indigenous Zanzibaris had invited Seyyid Said, the first Busaidi sultan, to their islandclaiming a patron-client relationship with powerful families was a strategy used by many Swahili coast towns since at least the fifteenth century. A narrow pedestrian alleyway in Stone Town, Zanzibar. Until around 1890, the sultans of Zanzibar controlled a substantial portion of the Swahili coast known as Zanj, which included Mombasa and Dar es Salaam. Beginning in 1886, Great Britain and Germany plotted to obtain parts of the Zanzibar sultanate for their own empires. :page: 188 In October 1886, a British-German border commission established the Zanj as a 10-nautical-mile-wide (19 km) strip along most of the African Great Lakes region's coast, an area stretching from Cape Delgado (now in Mozambique) to Kipini (now in Kenya), including Mombasa and Dar es Salaam. Over the next few years, however, almost all of these mainland possessions were lost to European imperial powers. The sultans developed an economy of trade and cash crops in the Zanzibar Archipelago with a ruling Arab elite. Ivory was a major trade good. The archipelago, sometimes referred to by locals as the Spice Islands, was famous worldwide for its cloves and other spices, and plantations were developed to grow them. 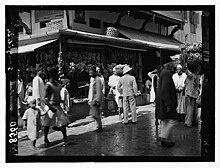 The archipelago's commerce gradually fell into the hands of traders from the Indian subcontinent, whom Said bin Sultan encouraged to settle on the islands. During his 14-year reign as sultan, Majid bin Said consolidated his power around the Arab slave trade. Malindi in Zanzibar City was the Swahili Coast's main port for the slave trade with the Middle East. In the mid-19th century, as many as 50,000 slaves passed annually through the port. Many were captives of Tippu Tib, a notorious Arab slave trader and ivory merchant. Tib led huge expeditions, some 4,000 strong, into the African interior, where chiefs sold him their villagers for next to nothing. These Tib used to caravan ivory back to Zanzibar, then sold them in the slave market for large profits. In time Tib became one of the wealthiest men in Zanzibar, the owner of multiple plantations and 10,000 slaves. Control of Zanzibar eventually came into the hands of the British Empire; part of the political impetus for this was the 19th century movement for the abolition of the slave trade. 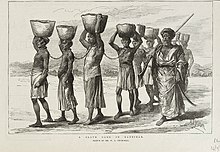 Zanzibar was the centre of the Arab slave trade, and in 1822, the British consul in Muscat put pressure on Sultan Said to end the slave trade. The first of a series of anti-slavery treaties with Britain was signed by Said which prohibited slave transport south and east of the Moresby Line, from Cape Delgado in Africa to Diu Head on the coast of India. Said lost the revenue he would have received as duty on all slaves sold, so to make up for this shortfall he encouraged the development of the slave trade in Zanzibar itself. Said came under increasing pressure from the British to abolish slavery, and in 1842 the British government told the Zanzibari ruler it wished to abolish the slave trade to Arabia, Oman, Persia, and the Red Sea. Ships from the Royal Navy were employed to enforce the anti-slavery treaties by capturing any dhows carrying slaves, but with only four ships patrolling a huge area of sea, the British navy found it hard to enforce the treaties as ships from France, Spain, Portugal, and the United States continued to carry slaves. In 1856, Sultan Majid consolidated his power around the African Great Lakes slave trade, and in 1873 Sir John Kirk informed his successor, Sultan Barghash, that a total blockade of Zanzibar was imminent, and Barghash reluctantly signed the Anglo-Zanzibari treaty which abolished the slave trade in the sultan's territories, closed all slave markets and protected liberated slaves. The relationship between Britain and the German Empire, at that time the nearest relevant colonial power, was formalized by the 1890 Heligoland-Zanzibar Treaty, in which Germany agreed to "recognize the British protectorate over ... the islands of Zanzibar and Pemba". The condition of a protected dependency is more acceptable to the half civilised races, and more suitable for them than direct dominion. It is cheaper, simpler, less wounding to their self-esteem, gives them more career as public officials, and spares of unnecessary contact with white men. From 1890 to 1913, traditional viziers were in charge; they were supervised by advisors appointed by the Colonial Office. However, in 1913 a switch was made to a system of direct rule through residents (effectively governors) from 1913. The death of the pro-British Sultan Hamad bin Thuwaini on 25 August 1896 and the succession of Sultan Khalid bin Barghash, whom the British did not approve of, led to the Anglo-Zanzibar War. On the morning of 27 August 1896, ships of the Royal Navy destroyed the Beit al Hukum Palace. A cease fire was declared 38 minutes later, and to this day the bombardment stands as the shortest war in history. On 10 December 1963, the Protectorate that had existed over Zanzibar since 1890 was terminated by the United Kingdom. The United Kingdom did not grant Zanzibar independence, as such, because the UK had never had sovereignty over Zanzibar. Rather, by the Zanzibar Act 1963 of the United Kingdom, the UK ended the Protectorate and made provision for full self-government in Zanzibar as an independent country within the Commonwealth. Upon the Protectorate being abolished, Zanzibar became a constitutional monarchy under the Sultan. However, just a month later, on 12 January 1964 Sultan Jamshid bin Abdullah was deposed during the Zanzibar Revolution. The Sultan fled into exile, and the Sultanate was replaced by the People's Republic of Zanzibar and Pemba, a socialist government led by the Afro-Shirazi Party (ASP). Over 20,000 people were killed and refugees, especially Arabs and Indians, escaped the island as a consequence of the revolution. In April 1964, the republic merged with mainland Tanganyika. This United Republic of Tanganyika and Zanzibar was soon renamed, blending the two names, as the United Republic of Tanzania, within which Zanzibar remains a semi-autonomous region. A street scene in Stone Town. Produce vendors at a market. The 2002 census is the most recent census for which results have been reported. The total population of Zanzibar was 984,625 – with an annual growth rate of 3.1 percent. The population of Zanzibar City, which was the largest city, was 205,870. Around two thirds of the people, 622,459, lived on Unguja (Zanzibar Island), with most settled in the densely populated west. Besides Zanzibar City, other towns on Unguja include Chaani, Mbweni, Mangapwani, Chwaka, and Nungwi. Outside of these towns, most people live in small villages and are engaged in farming or fishing. The population of Pemba Island was 362,166. The largest town on the island was Chake-Chake, with a population of 19,283. The smaller towns are Wete and Mkoani. Mafia Island, the other major island of the Zanzibar Archipelago but administered by mainland Tanzania (Tanganyka), had a total population of 40,801. The people of Zanzibar are of diverse ethnic origins. The first permanent residents of Zanzibar seem to have been the ancestors of the Bantu Hadimu and Tumbatu, who began arriving from the African Great Lakes mainland around AD 1000. They belonged to various mainland ethnic groups and on Zanzibar, generally lived in small villages. They did not coalesce to form larger political units. During Zanzibar's brief period of independence in the early 1960s, the major political cleavage was between the Shirazi (Zanzibar Africans), who made up approximately 56% of the population, and the Zanzibar Arabs, who made up approximately 17%. Today, Zanzibar is inhabited mostly by ethnic Swahili, a Bantu population of sub-Saharan Africans. There are also a number of Arabs, as well as some ethnic Persian and Indian people. Zanzibaris speak Swahili (Kiswahili), a Bantu language that is extensively spoken in the African Great Lakes region. Swahili is the de facto national and official language of Tanzania. Many local residents also speak Arabic, French and/or Italian. The main mosque and Anglican cathedral in Stone Town Zanzibar. Zanzibar's population is almost entirely Muslim, with a small Christian minority. The Anglican Diocese of Zanzibar was founded in 1892. The first Bishop of Zanzibar was Charles Smythies, who was translated from his former post as Bishop of Nyasaland. The cathedral, located in Stone Town, Zanzibar City, is a prominent landmark, and a national heritage asset. It had fallen into poor condition by the late 20th century, but it was fully restored in 2016, at a cost of one million Euros, with a world heritage visitor centre. The restoration was supported by the Tanzanian and Zanzibari governments, and overseen by the diocese in partnership with the World Monuments Fund. The restoration of the spire, clock, and historic Willis organ are still outstanding. Historically the diocese included mainland locations in Tanganyika. 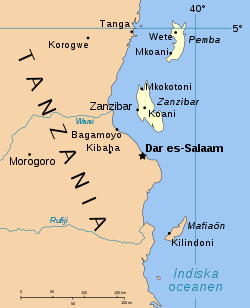 In 1963 it was renamed as the Diocese of Zanzibar & Dar es Salaam. Two years later, in 1965, Dar es Salaam became a separate diocese. The original jurisdiction was renamed as the Diocese of Zanzibar & Tanga. In 2001 the mainland links were finally ended, and the it is now known as the Diocese of Zanzibar. The diocese includes parishioners on the neighbouring island of Pemba. Ten bishops have served in the diocese from 1892 to the present day. The bishop is Michael Hafidh. It is part of the Province of Tanzania, under the Archbishop of All Tanzania, based at Dodoma. The Roman Catholic Diocese of Zanzibar was established in 1980. An apostolic vicariate of Zanzibar had been established in 1906, from a much larger East African jurisdiction. This was suppressed in 1953, when the territory was out under control of the Kenyan church, but it was restored in 1964 after independence. The church created a diocese here shortly before Easter 1980. The bishop is Augustine Ndeliakyama Shao. Zanzibar is part of the Roman Catholic Province of Dar es Salaam, under the Archbishop of Dar es Salaam. As a semi-autonomous part of Tanzania, Zanzibar has its own government, known as the Revolutionary Government of Zanzibar. It is made up of the Revolutionary Council and House of Representatives. The House of Representatives has a similar composition to the National Assembly of Tanzania. 50 members are elected directly from electoral constituencies to serve five-year terms; 10 members are appointed by the President of Zanzibar; 15 special seats are for women members of political parties that have representation in the House of Representatives; 6 members serve ex officio, including all regional commissioners and the attorney general. Five of these 81 members are then elected to represent Zanzibar in the National Assembly. Unguja has three administrative regions: Zanzibar Central/South, Zanzibar North and Zanzibar Urban/West. Pemba has two: Pemba North and Pemba South. Concerning the independence and sovereignty of Zanzibar, Tanzania Prime Minister Mizengo Pinda said on 3 July 2008 that there was "nothing like the sovereignty of Zanzibar in the Union Government unless the Constitution is changed in future". Zanzibar House of Representatives members from both the ruling party, Chama Cha Mapinduzi, and the opposition party, Civic United Front, disagreed and stood firmly in recognizing Zanzibar as a fully autonomous state. 12 Jan 2004: President Karume of Zanzibar enters Amani Stadium for the celebration of the 40th anniversary of Zanzibar's 1964 revolution. Zanzibar has a government of national unity, with the president of Zanzibar being Ali Mohamed Shein, since 1 November 2010. There are many political parties in Zanzibar, but the most popular parties are the Chama Cha Mapinduzi (CCM) and the Civic United Front (CUF). Since the early 1990s, the politics of the archipelago have been marked by repeated clashes between these two parties. Contested elections in October 2000 led to a massacre on 27 January 2001 when, according to Human Rights Watch, the army and police shot into crowds of protestors, killing at least 35 and wounding more than 600. Those forces, accompanied by ruling party officials and militias, also went on a house-to-house rampage, indiscriminately arresting, beating, and sexually abusing residents. Approximately 2,000 temporarily fled to Kenya. Violence erupted again after another contested election on 31 October 2005, with the CUF claiming that its rightful victory had been stolen from it. Nine people were killed. Following 2005, negotiations between the two parties aiming at the long-term resolution of the tensions and a power-sharing accord took place, but they suffered repeated setbacks. The most notable of these took place in April 2008, when the CUF walked away from the negotiating table following a CCM call for a referendum to approve of what had been presented as a done deal on the power-sharing agreement. In November 2009, the then-president of Zanzibar, Amani Abeid Karume, met with CUF secretary-general Seif Sharif Hamad at the State House to discuss how to save Zanzibar from future political turmoil and to end the animosity between them. This move was welcomed by many, including the United States. It was the first time since the multi-party system was introduced in Zanzibar that the CUF agreed to recognize Karume as the legitimate president of Zanzibar. A proposal to amend Zanzibar's constitution to allow rival parties to form governments of national unity was adopted by 66.2 percent of voters on 31 July 2010. The autonomous status of Zanzibar is viewed as comparable to Hong Kong as suggested by some scholars, and being recognized as the "African Hong Kong". A bird's view of the stone city in Zanzibar. Zanzibar is one of the Indian Ocean islands. It is situated on the Swahili Coast, adjacent to Tanganyika (mainland Tanzania). The northern tip of Unguja island is located at 5.72 degrees south, 39.30 degrees east, with the southernmost point at 6.48 degrees south, 39.51 degrees east. The island is separated from the Tanzanian mainland by a channel, which at its narrowest point is 36.5 kilometres (22.7 mi) across. The island is about 85 kilometres (53 mi) long and 39 kilometres (24 mi) wide, with an area of 1,464 km2 (565 sq mi). Unguja is mainly low lying, with its highest point being 120 metres (390 ft). Unguja is characterised by beautiful sandy beaches with fringing coral reefs. The reefs are rich in marine biodiversity. The northern tip of Pemba island is located at 4.87 degrees south, 39.68 degrees east, and the southernmost point is located at 5.47 degrees south, 39.72 degrees east. The island is separated from the Tanzanian mainland by a channel some 56 kilometres (35 mi) wide. The island is about 67 kilometres (42 mi) long and 23 kilometres (14 mi) wide, with an area of 985 km2 (380 sq mi). Pemba is also mainly low lying, with its highest point being 95 metres (312 ft). The heat of summer (corresponding to the Northern Hemisphere winter) is often cooled by strong sea breezes associated with the northeast monsoon (known as Kaskazi in Kiswahili), particularly on the north and east coasts. Being near to the equator, the islands are warm year round. The rainfall regime is split into two main seasons, a primary maximum in March, April, and May in association with the southwest monsoon (known locally as Kusi in Kiswahili), and a secondary maximum in November and December. The months in between receive less rain, with a minimum in July. The red colobus of Zanzibar (Procolobus kirkii), taken at Jozani Forest, Zanzibar, Tanzania. The main island of Zanzibar, Unguja, has a fauna reflecting its connection to the African mainland during the last Ice Age. Endemic mammals with continental relatives include the Zanzibar red colobus (Procolobus kirkii), one of Africa's rarest primates, with perhaps only 1,500 existing. Isolated on this island for at least 1,000 years, this colobus is recognized as a distinct species, with different coat patterns, calls, and food habits from related colobus species on the mainland. The Zanzibar red colobus lives in a wide variety of drier areas of coastal thickets and coral rag scrub, as well as mangrove swamps and agricultural areas. About one third of them live in and around Jozani Forest. The easiest place to see the colubus is farmland adjacent to the reserve. They are accustomed to people and the low vegetation means they come close to the ground. Rare native animals include the Zanzibar leopard, which is critically endangered and possibly extinct, and the recently described Zanzibar servaline genet. There are no large wild animals in Unguja. Forested areas such as Jozani are inhabited by monkeys, bushpigs, small antelopes, African civets, and, rumour has it, the elusive leopard. Various species of mongoose can also be found on the island. There is a wide variety of birdlife and a large number of butterflies in rural areas. Pemba Island is separated from Unguja island and the African continent by deep channels and has a correspondingly restricted fauna, reflecting its comparative isolation from the mainland. The island is home to the Pemba flying fox. Considerable disparities exist in the standard of living for inhabitants of Pemba and Unguja, as well as the disparity between urban and rural populations. The average annual income is US$250. About half the population lives below the poverty line. Despite a relatively high standard of primary health care and education, infant mortality in Zanzibar is 54 out of 1,000 live births, which is 10.0 percent lower than the rate in mainland Tanzania. The child mortality rate in Zanzibar is 73 out of 1,000 live births, which is 21.5 percent lower than the rate in mainland Tanzania. It is estimated that 7% of children on Zanzibar have acute malnutrition. Life expectancy at birth is 57 years, which is significantly lower than the 2010 world average of 67.2. 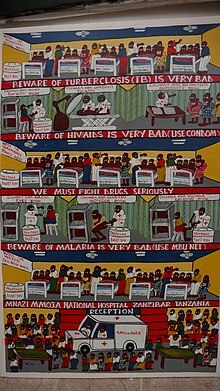 The general prevalence of HIV/AIDS in the sexually active population of Zanzibar is 0.6 percent, with the rate slightly higher in females (0.7 percent) than males (0.5 percent). The northern part of the island presents elevated volumes of trash in the streets, beaches and the ocean—mostly plastic bottles, other plastics and cigarette butts. There is indiscriminate dumping in residential areas. 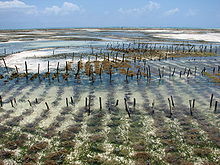 Aquaculture of red algae (Eucheuma), Jambiani, Zanzibar. Market stall in Zanzibar's Stone Town. Ancient pottery implies trade routes with Zanzibar as far back as the time of the ancient Assyrians. Traders from the Arabian Peninsula, the Persian Gulf region of modern-day Iran (especially Shiraz), and west India probably visited Zanzibar as early as the 1st century. They used the monsoon winds to sail across the Indian Ocean to land at the sheltered harbor located on the site of present-day Zanzibar City. The clove, originating from the Moluccan Islands (today in Indonesia), was introduced in Zanzibar by the Omani sultans in the first half of the 19th century. Zanzibar, mainly Pemba Island, was once the world's leading clove producer, but annual clove sales have plummeted by 80 percent since the 1970s. Zanzibar's clove industry has been crippled by a fast-moving global market, international competition, and a hangover from Tanzania's failed experiment with socialism in the 1960s and 1970s, when the government controlled clove prices and exports. Zanzibar now ranks a distant third with Indonesia supplying 75 percent of the world's cloves compared to Zanzibar's 7 percent. Zanzibar exports spices, seaweed and fine raffia. It also has a large fishing and dugout canoe production. Tourism is a major foreign currency earner. The Government of Zanzibar legalized foreign exchange bureaux on the islands before mainland Tanzania moved to do so. The effect was to increase the availability of consumer commodities. The government has also established a free port area, which provides the following benefits: contribution to economic diversification by providing a window for free trade as well as stimulating the establishment of support services; administration of a regime that imports, exports, and warehouses general merchandise; adequate storage facilities and other infrastructure to cater for effective operation of trade; and creation of an efficient management system for effective re-exportation of goods. There is also a possibility of oil availability in Zanzibar on the island of Pemba, and efforts have been made by the Tanzanian Government and Zanzibar revolutionary Government to exploit what could be one of the most significant discoveries in recent memory. Oil would help boost the economy of Zanzibar, but there have been disagreements about dividends between the Tanzanian mainland and Zanzibar, the latter claiming the oil should be excluded in Union matters. In 2007, a Norwegian consultancy firm went to Zanzibar to determine how the region could develop its oil potential. The firm recommended that Zanzibar follow economist Hernando de Soto Polar's ideas about the formalization of property rights for persons living on ancestral land for which they probably do not have a legal deed. In 1984, fewer than 20,000 tourists visited Zanzibar. Five times more visitors travelled to the island in 2000. The events of September 11, 2001 reduced the inflow of tourists, which was restored only after 2004. Zanzibar has at least 6,200 beds across 6 classes of accommodation. However, there is a disproportionately large number in ungraded, one and two star categories. The energy sector in Zanzibar consists of unreliable electric power, petroleum and petroleum products; it is also supplemented by firewood and its related products. Coal and gas are rarely used for either domestic and industrial purposes. Unguja (Zanzibar Island) gets most of its electric power from mainland Tanzania through a 39-kilometer, 100-megawatt submarine cable from Ras Kiromoni (near Dar es Salaam) to Ras Fumba on Unguja. The laying of the cable was begun on 10 October 2012 by the Viscas Corporation of Japan and was funded by a US$28.1 million grant from the United States through the Millennium Challenge Corporation. The cable became operational on 13 April 2013. The previous 45-megawatt cable, which was seldom-maintained, was completed by Norway in 1980. Since May 2010, Pemba Island has had a 75-kilometer, 25-megawatt, subsea electrical link directly to mainland Tanzania. The cable project was financed through a 45 million euro grant from Norway and contributions of 8 million euros from the Zanzibar government and 4 million euros from the Tanzanian national government. The project ended years of dependence on unreliable and erratic diesel generation subject to frequent power cuts. Only about 20 percent of the cable's capacity was being used in January 2011, so it is anticipated that the cable will meet the island's needs for 20 to 25 years. Between 70 and 75 percent of the electricity generated is used domestically while less than 20 percent is used industrially. Fuel wood, charcoal and kerosene are widely used as sources of energy for cooking and lighting for most rural and urban areas. The consumption capacity of petroleum, gas, oil, kerosene and industrial diesel oil is increasing annually, going from a total of 5,650 tons consumed in 1997 to more than 7,500 tons in 1999. From 21 May to 19 June 2008, Unguja suffered a major failure of its electricity system, which left the island without electrical service and mostly dependent on diesel generators. The failure originated in mainland Tanzania. Another blackout happened from 10 December 2009 to 23 March 2010, caused by a problem with the submarine cable that formerly supplied electricity from mainland Tanzania. This led to a serious shock to Unguja's fragile economy, which is heavily dependent on foreign tourism. Zanzibar has 1,600 kilometres of roads, of which 85 percent are tarmacked or semi-tarmacked. The remainder are earth roads, which are rehabilitated annually to make them passable throughout the year.. Zanzibar, to ensure the roads are passable at all times and are maintained had established a Road Fund Board, situated at maisala which collects funds and disburses to Ministry of Communication, whom is the Road Agency at this time through the Department of Road Maintenance, known as UUB. The Road Fund Board, oversees a Performance Agreement entered between the Ministry of Communication and Infrastructure, while all the procurements and maintenances are assumed by the later. There is no government-owned public transportation in Zanzibar. The privately owned Daladala, as it is officially known in Zanzibar, is the only kind of public transportation. The term Daladala originated from the Kiswahili word DALA(Dollar) or five shillings during the 1970s and 1980s when public transport cost five shillings to travel to the nearest town. Therefore travelling to town will cost a Dollar(“Dala”) and returning will again cost a Dollar, hence the term Daladala originated. There are five ports in the islands of Unguja and Pemba, all operated and developed by the Zanzibar Ports Corporation. The main port at Malindi, which handles 90 percent of Zanzibar's trade, was built in 1925. The port was rehabilitated between 1989 and 1992 with financial assistance from the European Union. The Italian contractor, Salini Impregilo S.p.A., was supposed to build wharves that lasted 60 years; however, the wharves lasted only 11 years before crumbling and degenerating because the company deviated from the specifications. After a long legal battle, the company was required in 2005 by the International Court of Arbitration to pay Zanzibar US$11.6 million in damages. The port was again rehabilitated between 2004 and 2009 with a 31 million euro grant from the European Union. The contract was awarded to M/S E. Phil and Sons of Denmark. The then-director of the contractor suggested that the rehabilitation would last a minimum of 50 years. But the port is again facing problems, including sinking. The MV Faith, which began its final journey at the port of Dar es Salaam, sank in May 2009 shortly before docking at the port of Malindi. Six of the 25 people aboard lost their lives. The sinking of the MV Spice Islander I on 10 September 2011, after departing from Unguja island for Pemba Island, was the worst disaster in Tanzanian history. In a report to the Zanzibar House of Representatives on 14 October 2011, Zanzibar's Second Vice President, Ambassador Seif Ali Iddi, said that 2,764 people were missing, 203 bodies had been recovered, and 619 passengers were rescued. It was the worst maritime disaster in Tanzanian history. A presidential commission, however, reported three months later that 1,370 people were missing, 203 bodies had been recovered, and 941 passengers survived. Severe overloading caused the ferry to sink. The MV Skagit, which also began its final journey at the port of Dar es Salaam, capsized in rough seas near Chumbe island on 18 July 2012. The ferry had 447 passengers, with 81 dead, 212 missing and presumed drowned, and 154 rescued. The ferry left port despite warnings from the Tanzania Meteorological Agency for ships not to attempt the crossing from Dar es Salaam to Unguja island because of the rough seas. A presidential commission reported in October 2012 that overloading was the cause of the disaster. Zanzibar's main airport, Zanzibar International Airport, has been able to handle large passenger planes since 2011, which has resulted in an increase in passenger and cargo inflows and outflows. Since another increase in capacity by the end of 2013, it can serve up to 1.5 million passengers per year. The island can be reached by flights operated by Auric Air, Kenya Airways, Qatar Airways, Turkish Airlines, FlyDubai, Mango Airline and Coastal Aviation. A view of the clock tower in House of Wonders through Islamic styled door in the Stone City of Zanzibar. Zanzibar's most famous event is the Zanzibar International Film Festival, also known as the Festival of the Dhow Countries. Every July, this event showcases the best of the Swahili Coast arts scene, including Zanzibar's favorite music, taarab. Important architectural features in Stone Town are the Livingstone house, The Old dispensary of Zanzibar, the Guliani Bridge, Ngome kongwe (The Old fort of Zanzibar) and the House of Wonders. The town of Kidichi features the Hamamni Persian Baths, built by immigrants from Shiraz, Iran during the reign of Barghash bin Said. Zanzibar also is the only place in Eastern African countries to have the longest settlement houses formally known as Michenzani flats which were built by the aid from East Germany during the 1970s to solve housing problems in Zanzibar. In 1973, Zanzibar introduced the first colour television service in sub-Saharan Africa. Because of longstanding opposition to television by President Julius Nyerere, the first television service on mainland Tanzania was not introduced until 1994. The broadcaster in Zanzibar called Television Zanzibar (TVZ) had recently changed name to Zanzibar Broadcasting Corporation (ZBC). following an enactment of an act to make it a public corporation, monitored under the Ministry of Finance by the treasurer registrar. Among the famous reporters of TVZ during the 1980s and 1990s were the late Alwiya Alawi 1961–1996 (the elder sister of Inat Alawi, famous Taarab singer during the 1980s), Neema Mussa, Sharifa Maulid, Fatma Mzee, Zaynab Ali, Ramadhan Ali, and Khamis. Zanzibar has one AM radio station and 21 FM radio stations. In terms of landline communications, Zanzibar is served by the Tanzania Telecommunications Company Limited and Zantel Tanzania. Almost all mobile and Internet companies serving mainland Tanzania are also available in Zanzibar. In 2000 there were 207 government schools and 118 privately owned schools in Zanzibar. Zanzibar has three fully accredited Universities: Zanzibar University, the State University of Zanzibar (SUZA) and Sumait University (previously University College of Education, Chukwani). SUZA was established in 1999, and is located in Stone Town, in the buildings of the former Institute of Kiswahili and Foreign Language (TAKILUKI). It is the only public institution for higher learning in Zanzibar, the other two institutions being private. In 2004, the three institutions had a total enrollment of 948 students, of whom 207 were female. The primary and secondary education system in Zanzibar is slightly different from that of the Tanzanian mainland. On the mainland, education is only compulsory for the seven years of primary education, while in Zanzibar an additional three years of secondary education are compulsory and free. Students in Zanzibar score significantly less on standardized tests for reading and mathematics than students on the mainland. In the 1970s, 1980s and 1990s, national service after secondary education was necessary, but it is now voluntary and few students volunteer. Most choose to seek employment or attend teacher's colleges. A bird's view of Amaan Stadium in Zanzibar. Football is the most popular sport in Zanzibar, overseen by the Zanzibar Football Association. Zanzibar is an associate member of the Confederation of African Football (CAF), but not of FIFA. This means that the Zanzibar national football team is not eligible to enter national CAF competitions, such as the African Nations Cup, but Zanzibar's Football Clubs get representation at the CAF Confederation Cup and the CAF Champions League. The national team participates in non-FIFA Football tournaments such as the FIFI Wild Cup, and the ELF Cup. Because Zanzibar is not a member of FIFA, their team is not eligible for the FIFA World Cup. The Zanzibar Football Association also has a Premier League for the top clubs, which was created in 1981. Since 1992, there has also been judo in Zanzibar. The founder, Tsuyoshi Shimaoka, established a team that participates in national and international competitions. In 1999, Zanzibar Judo Association (Z.J.A.) was registered and became an active member of the Tanzania Olympic Committee and International Judo Federation. Annie Allen, Englishwoman who came to call Zanzibar home after doing extensive medical missionary work there. Freddie Mercury (born Farrokh Bulsara), British singer of the rock band Queen, was born in Stone Town, Zanzibar. He fled to the United Kingdom during the Zanzibar Revolution. Lubaina Himid, artist and winner of the 2017 Turner Prize, born 1954. House of Wonders undergoing refurbishment. ^ Kendall, David (2014). "Zanzibar". nationalanthems.info. Retrieved 29 January 2015. ^ MWACHANG`A, DEVOTA (23 May 2014). "Kikwete to grace launch of 2012 statistics report". IPP Media. ^ "Gross Domestic Product (GDP) in Zanzibar". www.ushnirs.org. Archived from the original on 16 October 2015. Retrieved 3 July 2014. ^ "Exotic Zanzibar and its seafood". Exotic Zanzibar and its seafood. Retrieved 11 June 2011. ^ Richard F. Burton (2010). The Lake Regions of Central Africa. New York: Cosimo, Inc. p. 38. ISBN 978-1-61640-179-5. ^ Mehrdad Shokoohy (2013). Muslim Architecture of South India: The Sultanate of Ma'bar and the Traditions of Maritime Settlers on the Malabar and Coromandel Coasts (Tamil Nadu, Kerala and Goa). New York: Routledge. p. 137. ISBN 978-1-136-49977-7. ^ Hashim, Nadra O. (2009). Language and Collective Mobilization: The Story of Zanzibar. Lexington Books. p. xi. ISBN 978-0-7391-3708-6. ^ Kusimba, Chapurukha, and Walz, Jonathan. (2018.) "When did the Swahili become Maritime? : A Reply to Fleisher et al. (2015), and to the Resurgence in Maritime Myopia in the Archaeology of the East African Coast", American Anthropologist 120(3). ^ Horton, Mark and Middleton, Tom. "The Swahili: The Social Landscape of a Mercantile Community." (Oxford: Blackwell, 2010), 46. ^ Horton, Mark and Middleton, John. "The Swahili: The Social Landscape of a Mercantile Community." (Oxford: Blackwell, 2010), 119. ^ Kusimba, Chapurukha. "The Rise and Decline of Swahili States." (Walnut Creek, California: Altamira, 1999). ^ a b c d Ingrams, W. H. (1 June 1967). "Zanzibar: Its History and Its People". Psychology Press. Retrieved 12 March 2018 – via Google Books. ^ a b c Sir Charles Eliot, K.C.M.G., The East Africa Protectorate, London: Edward Arnold, 1905, digitized by the Internet Archive in 2008 (PDF format). ^ "The Harem and Tower Harbour of Zanzibar". Chronicles of the London Missionary Society. 1890. Retrieved 2 November 2015. ^ Prestholdt, Jeremy. "Portuguese Conceptual Categories and the “Other” Encounter on the Swahili Coast." Journal of Asian American Studies, Volume 36, Issue 4, 390. ^ N. S. Kharusi, "The ethnic label Zinjibari: Politics and language choice implications among Swahili speakers in Oman", Ethnicities, 12(3) 335–353, 2012. ^ Meier, Prita. "Swahili Port Cities: The Architecture of Elsewhere." (Bloomington Indiana: Indiana University press, 2016) Pg. 103. ^ "Swahili Coast: East Africa's Ancient Crossroads", in a "Did You Know?" sidebar by Christy Ullrich, National Geographic. ^ a b Chris McIntyre, Susan McIntyre (2013). "Zanzibar", Bradt Travel Guides, p. 10. ^ Chris McIntyre, Susan McIntyre (2013), "Zanzibar", Bradt Travel Guides, p.13. ^ Chris McIntyre, Susan McIntyre (2013), "Zanzibar", Bradt Travel Guides, p. 14. ^ Chris McIntyre, Susan McIntyre (2013). "Zanzibar", Bradt Travel Guides, p. 19. ^ Article XI, Anglo-German Treaty (Heligoland-Zanzibar Treaty), 1 July 1890 (PDF format). ^ "The forgotten genocide of the Zanzibar revolution - Speak Magazine". Speak Magazine. Retrieved 4 January 2016. ^ "2002 Population and Housing General Report: South Unguja". Archived from the original on 18 March 2004. ^ a b c d e "People and Culture – Zanzibar Travel Guide". Zanzibar-travel-guide.com. Retrieved 27 August 2010. ^ "2002 Population and Housing Census General Report: Pemba". Archived from the original on 10 June 2007. ^ "2002 Population and Housing Census General Report: Mafia". Archived from the original on 10 June 2007. ^ "Zanzibar People and Culture". Archived from the original on 4 March 2016. ^ GROWup - Geographical Research On War, Unified Platform. "Ethnicity in Zanzibar". ETH Zurich. Retrieved 24 October 2018. ^ Sheriff, Abdul (2001). "Race and Class in the Politics of Zanzibar". Africa Spectrum. 36 (3): 301–318. JSTOR 40174901. ^ Tanzania (08/09) Archived 14 January 2014 at the Wayback Machine. U.S. Department of State. ^ Chris McIntyre and Susan McIntyre, "Zanzibar, Pemba, and Mafia", Bradt Travel Guide, 2009, p. 36. ^ a b "The World Factbook — Central Intelligence Agency". www.cia.gov. Retrieved 12 March 2018. ^ Progress report and photographs at this webpage. ^ "Tanzania Regions". www.statoids.com. Retrieved 12 March 2018. ^ "Zanzibar: Premier under fire on Zanzibar status". Unrepresented Nations and Peoples Organization. 10 July 2008. Retrieved 23 October 2012. ^ "Tanzania: Zanzibar Election Massacres Documented". Human Rights Watch. 10 April 2002. Retrieved 27 August 2010. ^ "Zimbabwe Farm Evictions 2000". karelprinsloo karel prinsloo. ^ "Tanzanian Affairs » ZANZIBAR – A BIG DISAPPOINTMENT". www.tzaffairs.org. Retrieved 12 March 2018. ^ "Welcome to VPP Zanzibar, Tanzania". United States Virtual Presence Post. U.S. Department of State. Archived from the original on 3 February 2011. Retrieved 27 August 2010. ^ "Zanzibar: 2010 Constitutional referendum results" Archived 5 January 2016 at the Wayback Machine, Electoral Institute for the Sustainability of Democracy in Africa, updated August 2010. ^ Simon Shen, One country, two systems: Zanaibar, Ming Pao Weekly, Sep 2016. ^ a b "Find Latitude and Longitude". www.findlatitudeandlongitude.com. Retrieved 12 March 2018. ^ a b c "The Africa Guide – Zanzibar". web page. africaguide.com. Retrieved 26 October 2012. ^ Molly Moynihan, "Water Quality and Eutrophication: The Effects of Sewage Outfalls on Waters and Reefs Surrounding Stone Town, Zanzibar", Independent Study Project Collection, 2010, p. 8. ^ "Climate and Soils". Zanzinet Forum. Archived from the original on 6 October 2014. ^ "Weatherbase: Historical Weather for Zanzibar, Tanzania". Weatherbase. 2011. Retrieved 24 November 2011. ^ a b Pakenham, R. H. W. (1984). The Mammals of Zanzibar and Pemba Islands. Harpenden: privately printed. Retrieved 27 August 2010. ^ a b Walsh, Martin T. (2007). "Island Subsistence: Hunting, Trapping and the Translocation of Wildlife in the Western Indian Ocean". Azania. 42: 83–113. doi:10.1080/00672700709480452. Retrieved 27 August 2010. ^ "Red Colobus". galenfrysinger.com. Retrieved 27 August 2010. ^ "Tanzania Demographic and Health Survey 2010", National Bureau of Statistics, Dar es Salaam, published April 2011, page 120 (PDF format). ^ "Tanzania Demographic and Health Survey and Malaria Indicator Survey 2015-2016 - Final Report" (PDF). DHS Program. Retrieved 1 April 2019. ^ Professor Trevor Marchand. Oman & Zanzibar: The Sultans of Oman Archived 31 October 2013 at the Wayback Machine. Archaeological Tours. ^ a b Sanders, Edmund (24 November 2005). "Zanzibar Loses Some of Its Spice". Los Angeles Times. Retrieved 27 August 2010. ^ "Zanzibar Then and Now". www.zanzibarholidays.co.uk. Retrieved 14 June 2016. ^ Bureau of African Affairs (8 June 2010). "Background Note: Tanzania". U.S. Department of State. Retrieved 27 August 2010. ^ Chambi Chachage, "Norway in Tanzania: The Battle Rages"[better source needed] Archived 4 March 2016 at the Wayback Machine, The African Executive. ^ "Tanzania Invest - Zanzibar Tourism Sector". ^ "Ambassador Lenhardt Participates in Ceremony to Install 100 Megawatt Submarine Power to Zanzibar" Archived 17 February 2013 at the Wayback Machine. Press Release, Embassy of the United States, Dar es Salaam, Tanzania, 10 October 2012. ^ 132kV Sabmarine Cable - Zanzibar Iterconnector at Ras Kiromoni and Ras Fumba, Featured Project, Salem Construction, Ltd.
^ Yussuf, Issa (24 April 2013). "Tanzania: Reliable Power to Accelerate Development in Isles President Ali". Daily News (via AllAfrica.com). Retrieved 14 September 2013. ^ "Zanzibar Power: Electrical And Political Shortages", Cable from the United States Embassy in Dar Es Salaam to the United States Secretary of State Archived 2 May 2013 at the Wayback Machine, reference identification 08DARESSALAAM839, 15 December 2008. ^ Press release (3 June 2010). "Nexans Completes Subsea Cable Link to Provide Reliable Power for Pemba Island in Zanzibar – New 25 MVA Link to Mainland Grid Has Enabled the Local Population to End Years of Dependence on Unreliable Diesel Generators" Archived 5 May 2013 at the Wayback Machine. Nexans. Retrieved 14 September 2013. ^ "Reliable electricity attracts investors to Pemba", Norway: The Official Site in Tanzania, 28 January 2011. ^ Staff (30 May 2008). "Melting in Zanzibar's Blackout". BBC News. Retrieved 14 September 2013. ^ O'Connor, Maura R. (1 April 2010; updated 30 May 2010). "Zanzibar's Three-Month Blackout – Indian Ocean islands Go for 90 Days Without Power, Causing Business Problems and Water Shortages". GlobalPost. Retrieved 14 September 2013. ^ a b Yusof, Issa (17 October 2012). "Malindi Port Gradually Sinking". Daily News. Archived from the original on 3 May 2013. ^ Staff (29 November 2008). "Zanzibar (Malindi) Nears Completion" Archived 9 September 2014 at the Wayback Machine, World Cargo News. Retrieved 14 September 2013. ^ Hutson, Terry (30 July 2009). "Fire Guts Passenger Ferry in Dar es Salaam". Ports & Ships Maritime News. Retrieved 14 September 2013. ^ Sadallah, Mwinyi (16 October 2011). "Confirmed: 2,900 People Died in Zanzibar's Ferry Tragedy" Archived 12 January 2016 at the Wayback Machine. IPP Media. Retrieved 14 September 2013. ^ Sadallah, Mwinyi (21 January 2012). "Nine Charged over MV Spice Islander Sinking", IPP Media. Retrieved 14 September 2013. ^ Staff (19 July 2012). "Zanzibar Ferry Disaster: Hopes Fade for Missing". BBC News. Retrieved 14 September 2013. ^ Yussuf, Issa (12 October 2012). "Tanzania: Overloading Blamed for Ill-Fated Boat". Daily News (via AllAfrica.com). Retrieved 14 September 2013. 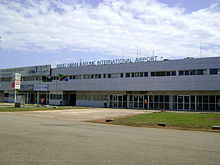 ^ "Zanzibar forms Airports Authority, modernises aviation infrastructure". Business Times (Tanzania). Retrieved 17 January 2013. ^ "Auric Air". Auric Air Services Ltd. 30 March 2012. Retrieved 30 March 2012. ^ "Coastal Aviation". Coastal Aviation. 2015. Retrieved 29 January 2015. ^ "?". Archived from the original on 16 November 2012. ^ Martin Stumer, "The Media History of Tanzania", Salzburg, Austria: Ndanda Mission Press, 1998, pp. 191, 194, 295. ^ a b c "Education in Zanzibar – Southern and Eastern African Consortium for Monitoring Educational Quality". Sacmeq.org. Archived from the original on 2 July 2011. Retrieved 4 April 2011. ^ "SUZA website". Suza.ac.tz. Retrieved 4 April 2011. ^ "Tanzania entry – SACMEQ". Sacmeq.org. Archived from the original on 2 July 2011. Retrieved 4 April 2011. ^ "?". Retrieved 11 August 2010. ^ Anderson-Morshead, Anne (1897). The History of the Universities' Mission to Central, 1859-1909. ^ "The wonders of Zanzibar's Stone Town - The Spectator". spectator.co.uk. 17 October 2015. Retrieved 12 March 2018. ^ Levin, Angela (8 September 2012). "Exclusive interview: Freddie Mercury's mother on her 'dear boy'". Retrieved 12 March 2018 – via www.telegraph.co.uk. ^ "Fashion Designers: Farouque Abdela". Fashion Week Zanzibar. Retrieved 12 May 2015. ^ "Abdulrazak Gurnah - Literature". literature.britishcouncil.org. Retrieved 12 December 2017. ^ "Abdulrazak Gurnah". www.encyclopediaofafroeuropeanstudies.eu. Retrieved 12 December 2017. Emily Ruete, Memoirs of an Arabian Princess from Zanzibar, 1888 (many reprints). The author (1844–1924) was born Princess Salme of Zanzibar and Oman and was a daughter of Sayyid Said. Pearce, Francis Barrow (1920). Zanzibar, the Island Metropolis of Eastern Africa New York, NY: E. P. Dutton and Company.